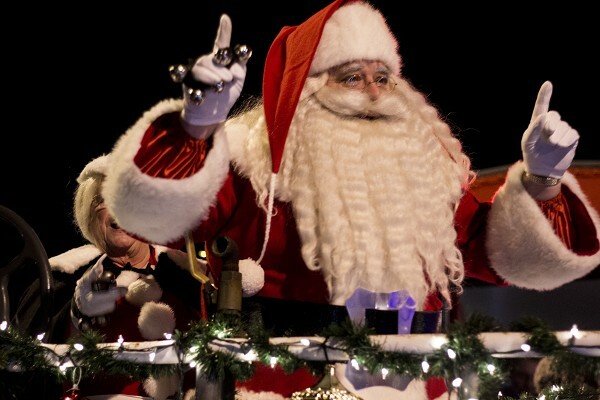 MyBayCity.com Santa Creates Magical Memories for Local Children! Santa leads the group in carols! Saturday November 24th was a night that countless children from all over Bay City will cherish forever. The kids got the chance to meet Santa Claus, who traveled all the way from the North Pole to sing carols and create magical memories for all. Santa arrived at 6 P.M. sharp, along with Mrs. Claus, via their own personal train decorated in Christmas lights. They were met by the hundreds in attendance who eagerly anticipated the chance to meet jolly old Saint Nick. "We got here around 3 o'clock," said attendee Holly Beyel. Beyel's group was in the front of the line that stretched down the sidewalk and up John F. Kennedy Drive. Haylee Kussro, who was also in line since 3 P.M., didn't want to forget anything when she finally got to meet Santa, so she brought her own Christmas list. "I want the iPod touch the most!" said an excited Kussro. When Mr. and Mrs. Claus first arrived, the duo led the crowd in a few Christmas carols to celebrate the occasion. Singing Rudolph the Red Nosed Reindeer brought a smile to everyone's face and put them all in a festive mood on the chilly night. But before Santa continued on in to his house he reminded everyone just how we can all get those gifts under the tree. "Remember, eat your vegetables, [...] play nice with your brothers and sisters, [...] work hard in school, [...] and make sure you go to bed on time! Ho! Ho! Ho!" While the night was one to remember, it wasn't the only chance children will get to meet Santa. "I'll be around until the 22nd of December!" said a jolly Mr. Claus. The Nate and Mary Ida Doan Santa House, located on John F. Kennedy Drive, is open for visits seven days a week. Santa is available from 6:00 P.M. until 8:30 P.M. with additional hours on Saturday and Sundays from 1:00 P.M. until 4 P.M giving you plenty of chances to meet Father Christmas himself to make your own magical memories! Santa and Mrs. Claus take a look at Haylee's list. Santa lets everyone know how to get those presents!